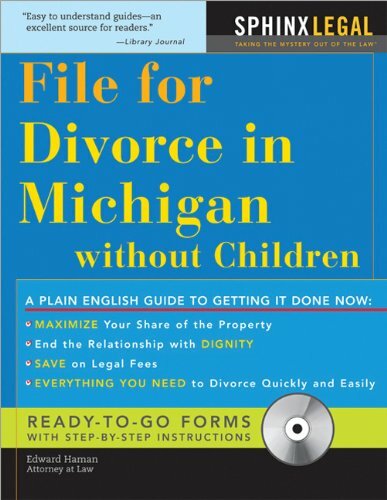 File for Divorce in Michigan has been made even easier to use with this streamlined version for couples with no child-related issues to be concerned with. Still written in straightforward language with everything you need to successfully handle your own divorce in Michigan, File for Divorce in Michigan without Children is the better alternative for those without children seeking divorce. Edward A. Haman earned his Bachelor's Degree from Western Michigan University and his law degree from the University of Toledo. Haman has served as a Michigan Circuit Court domestic relations hearing officer and has practiced law in Florida, Michigan, and Hawaii. Drawing on his knowledge of the law, Haman has authored close to two dozen self-help law books, including How to Write Your Own Living Will, How to File Your Own Divorce, and The Power of Attorney Handbook. In his book The Complete Guide to Filing Your Own Bankruptcy, Haman simplifies and thoroughly explains everything you need to know to prepare for Chapter 7 or Chapter 13 bankruptcy.